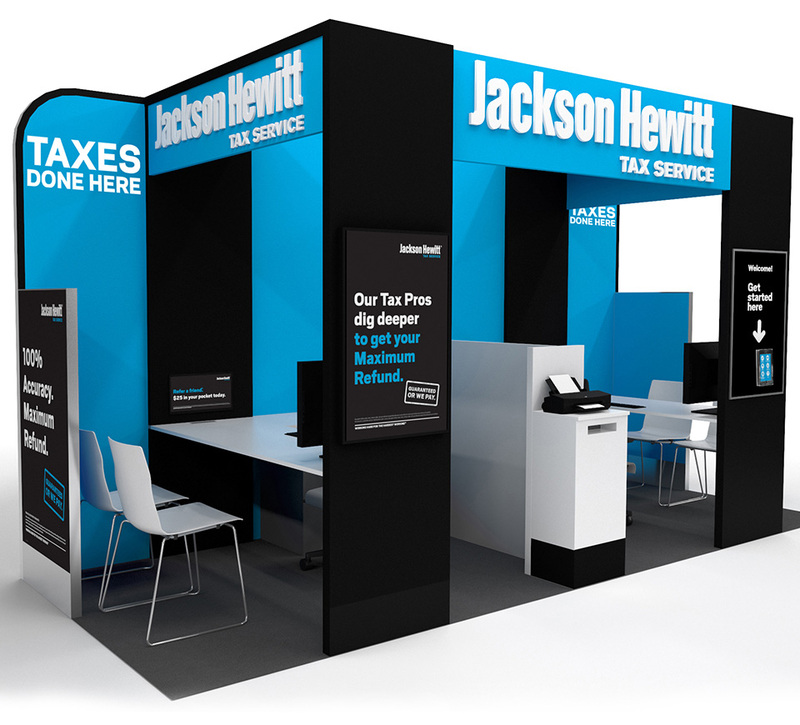 SLD was commissioned to increase the visibility of the new Jackson Hewitt brand during peak tax prep periods. 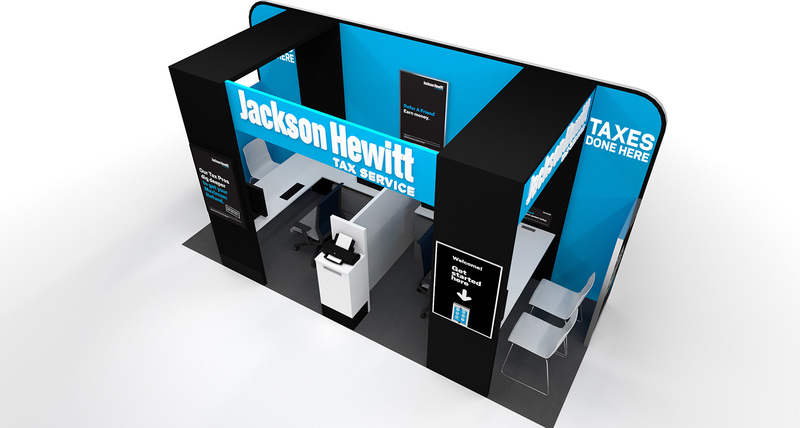 As the second-largest tax-preparation innovator in the tax industry, Jackson Hewitt Tax Service Inc. offers clients access to simple, low-cost solutions to manage their taxes and tax refunds. 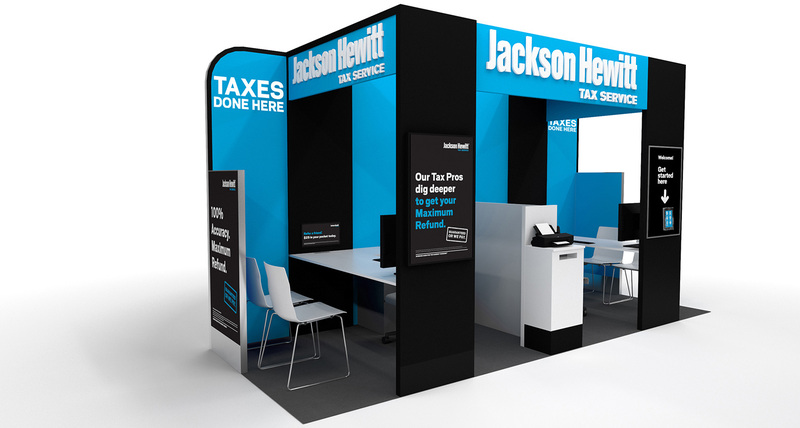 Devoted to helping their clients, Jackson Hewitt has approximately 6,000 franchised and company-owned locations, including 3,000 kiosks in Walmart stores. 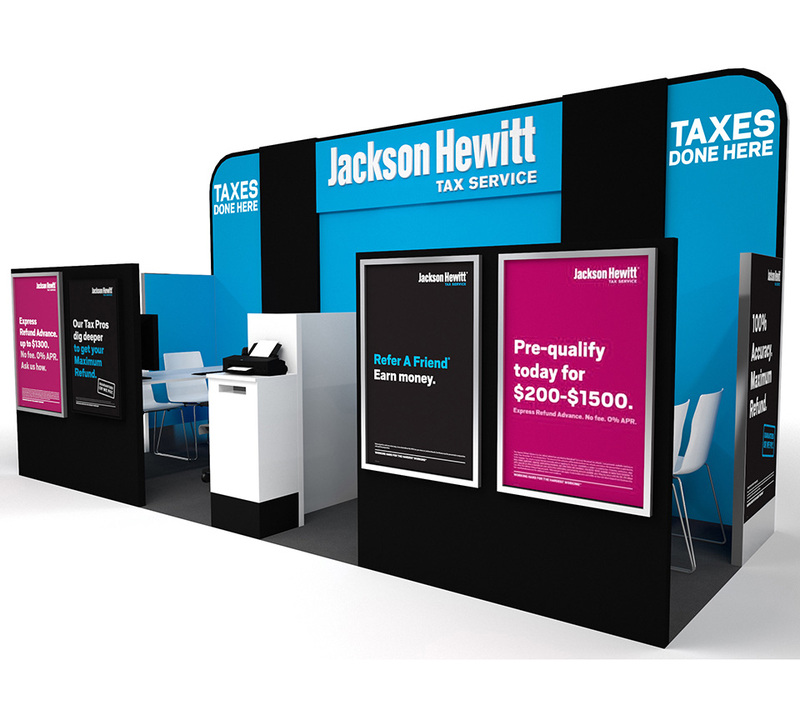 SLD partnered with Jackson Hewitt to design a consistent brand identity across all its inline stores and Walmart kiosks. The objective of this redesign was to create a cost-effective program that can be retrofitted across new and existing locations and tiered to different financial models within the company and franchise footprints. 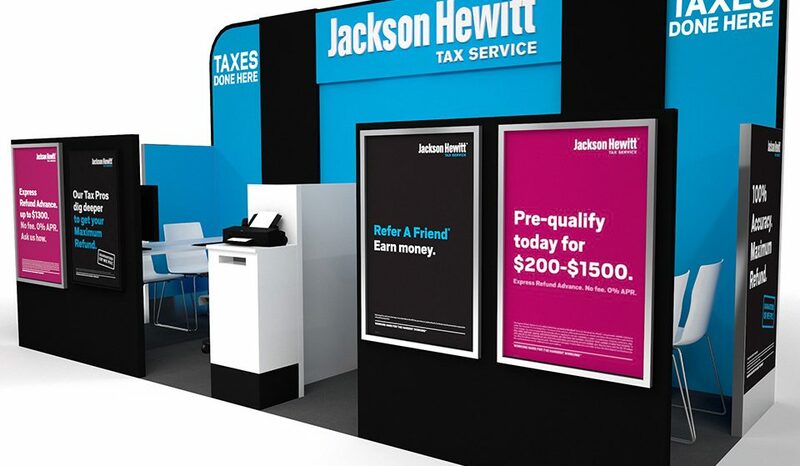 This new identity and inline store/kiosk design had to effectively communicate the range of services Jackson Hewitt provides beyond tax preparation, while targeting the middle-class American who feels underserved by other financial/tax advice centers. During brand strategy and design ideation, the SLD team came across some challenges. 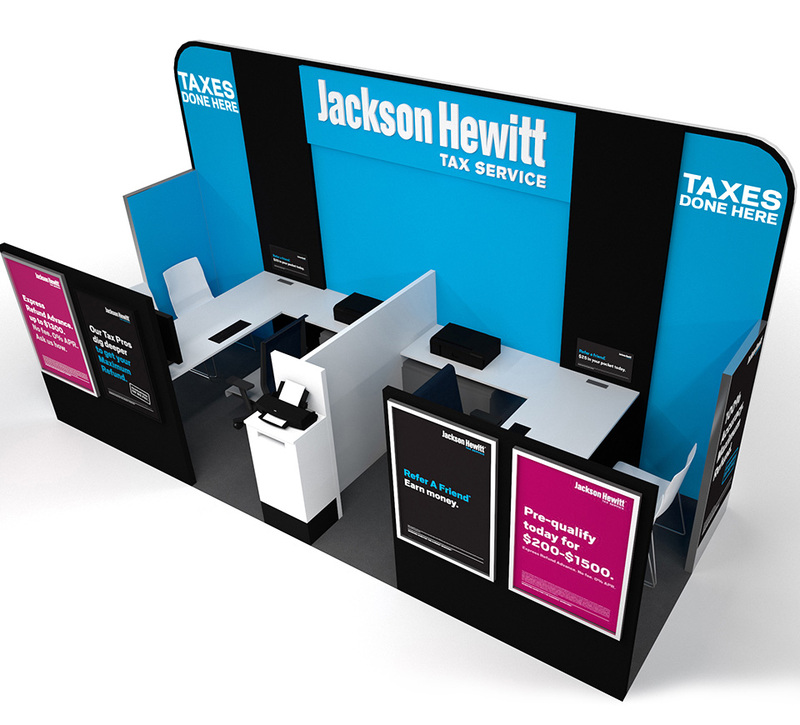 The branding and design of the kiosks needed to effectively communicate Jackson Hewitt’s range of services beyond tax preparation while re-enforcing strong promotional offers during peak tax periods. The physical kiosk design had many challenges. 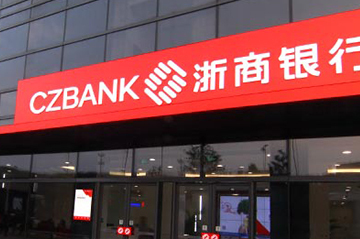 The current design was very congested and did not allow for any privacy for customers when discussing confidential financial information. The current kiosk design was lost in the large Walmart store. 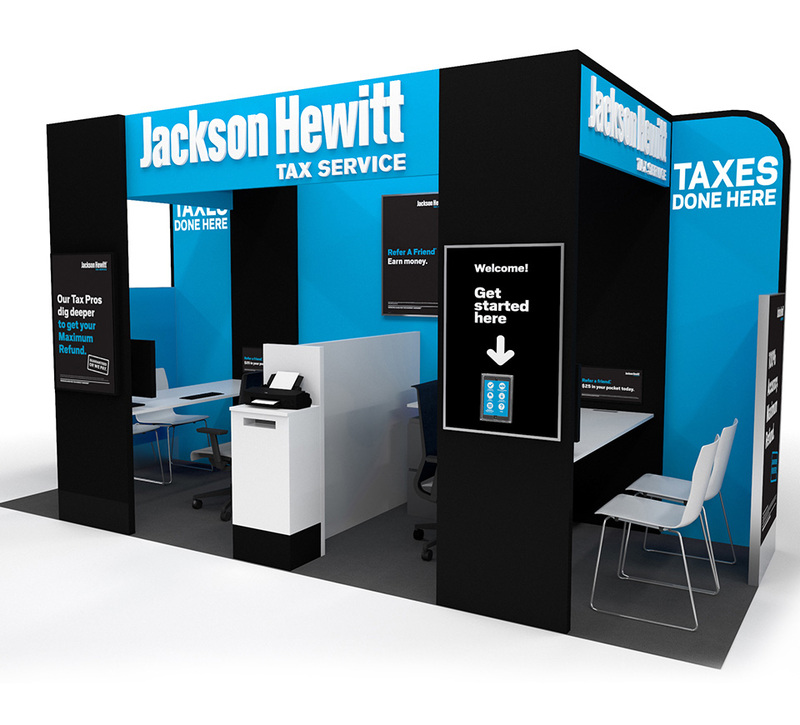 SLD had to create a kiosk that was representative of the brand, easily identifiable for the consumer, fully functional for staff, and modular in design. SLD identified areas of opportunity to create more immersive customer experiences while effectively delivering a cohesive brand and functional kiosk design. SLD conducted a forensic review of customer segmentation and background information. Interviews were conducted with management and staff to solidify staff needs, priorities, and to better understand kiosk functionality. To ensure brand cohesion, workshops were held with franchisees to understand their requirements to successfully deliver a brand experience. This was further validated at the Jackson Hewitt franchisee conference. Additional research on the conceptual design was conducted to evaluate the effectiveness of customer engagement. 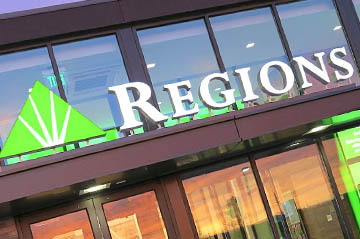 The inline store exterior design reduces the visual noise and focuses primarily on functional signage. The window space was optimized to address the challenging architectural storefront elements. Large window billboards were designed to the scale of vehicular traffic speed and to overcome window glare. The new signage provides Jackson Hewitt customers with a welcoming message and a grateful sendoff. 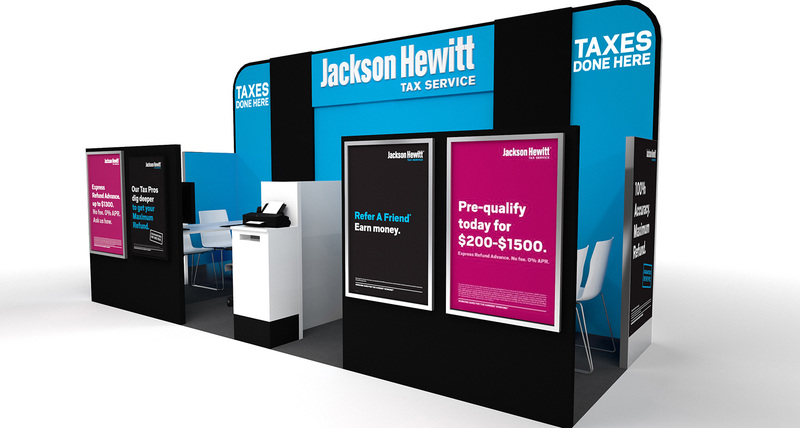 For visual impact, colorful promotional window clings were used to highlight Jackson Hewitt’s position and services. 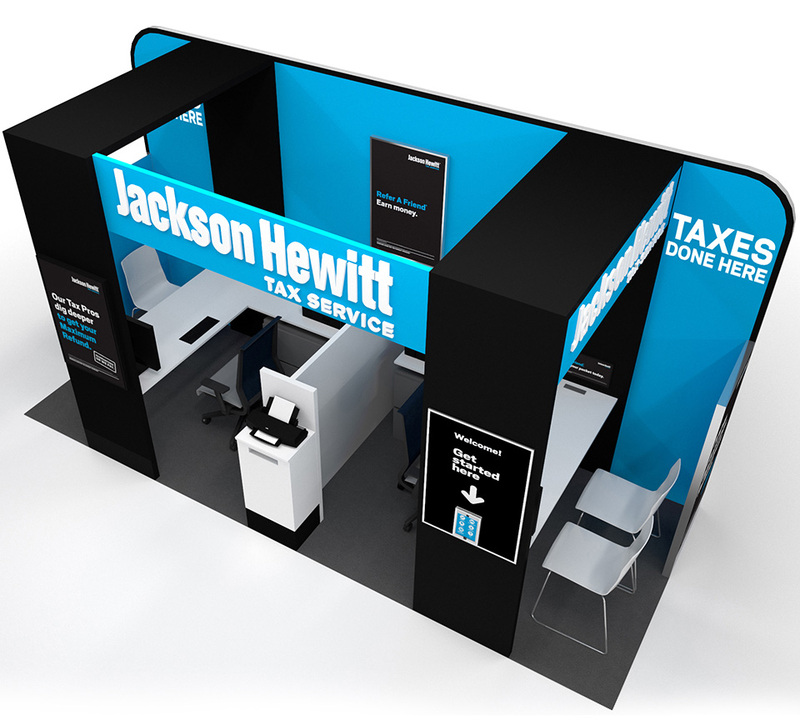 The interior of the inline store reinforces the Jackson Hewitt brand as the white logo sits on a blue back wall. The rotated reception desk allows for more privacy and the new interior design allows for better integration of merchandising and in-office communication. 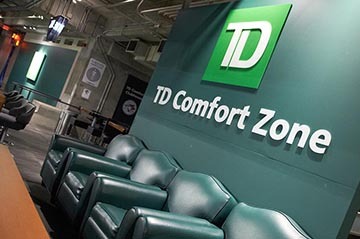 The interior messaging and graphics address sight lines for consumers as they enter the store. The messaging reinforces a wider range of services and explores transaction driven offers. The use of blue is reduced in the signage and graphics for visual impact while still owning the iconic brand color. Lifestyle photos used throughout the inline store replace the former bland photos on the walls. 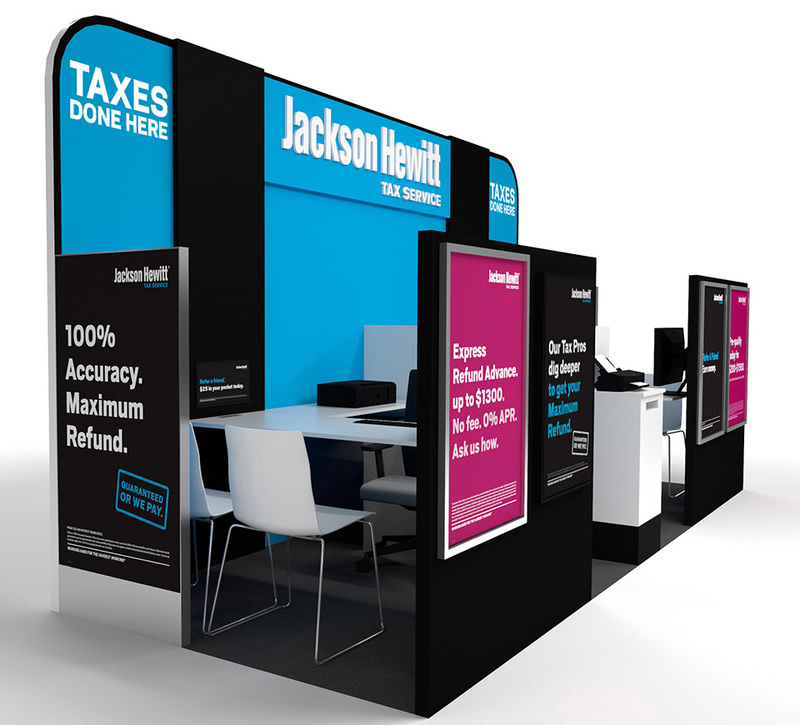 Vertical snap frame posters are mounted closer to station table tops for promotional usage. 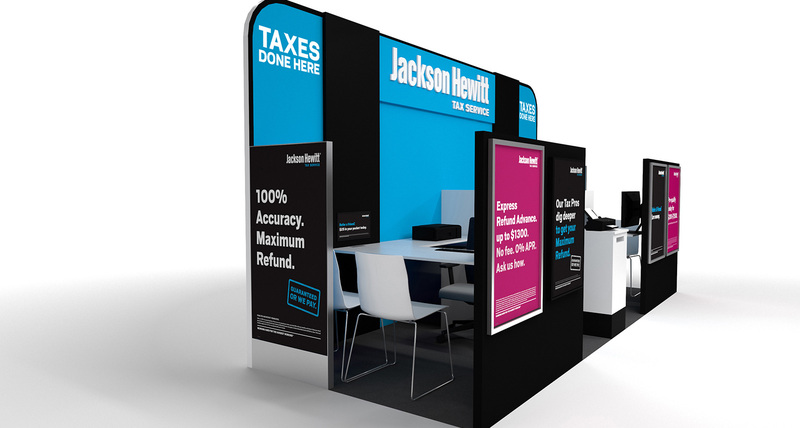 The kiosk design helps Jackson Hewitt differentiate itself from Walmart with unique architecture and large, impactful messaging. 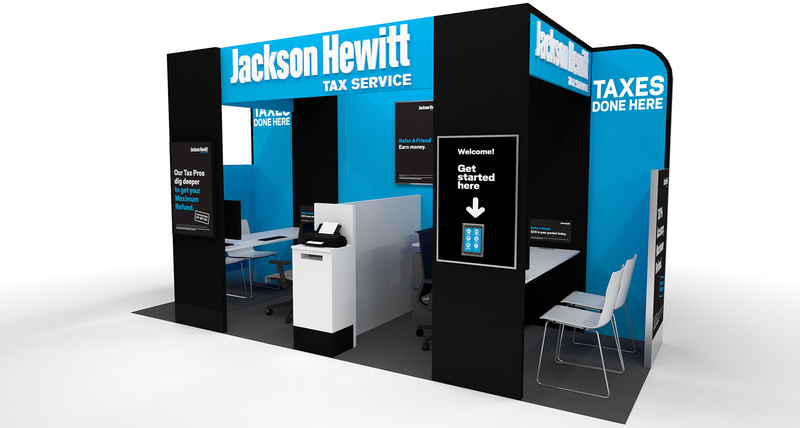 Archways with Jackson Hewitt branding reinforce brand recognition and clearly define the space. 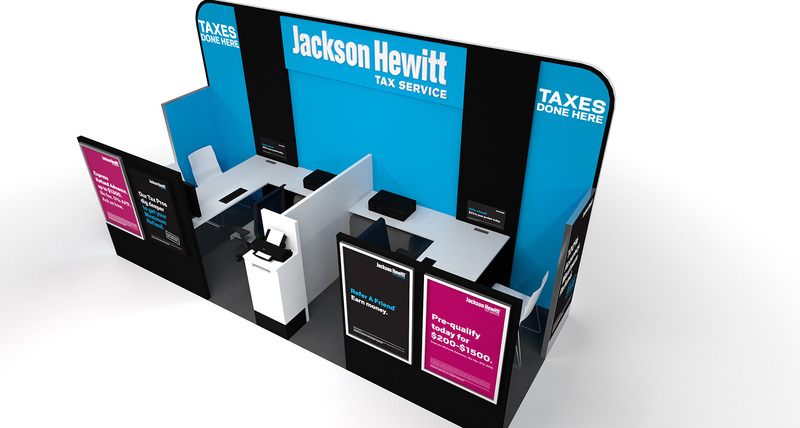 The innovative kiosk structure maximizes the small space while optimizing usage and functionality for both staff and customers. The physical structure is light weight, durable, and cost-efficient. The kiosks can be easily assembled by franchisee owners and will withstand three to four years of usage. The space is scalable with the ability to change out the color palette and graphics as needed. Along the customer journey, clear branding, marketing, and instructional messaging are used to ensure an optimal experience. Side paneling provides private spaces for customers with added features such as coat hooks and charging stations. SLD has rolled out several prototype locations and has continued to consult on inline renovations and new construction. Approximately 50 inline stores are set to open in 2017.